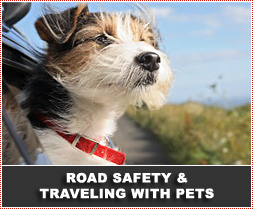 Traveling with the family pet is a potential hazard for both the animal and owner. Pets can cause distractions for the driver and sudden stops could cause severe injury or death to the pet. An EU Regulation for transporting animals came into effect from 5 January 2007 and is intended to improve the welfare of animals during transport for economic activity. Even though these regulations are not intended for traveling with pets, it is important to note that the European Union has recognized the need of fitness to travel and the importance to be attentive to the safety and health not only of drivers, but also of animals being transported. Today, more and more people consider their pets as true members of their families, and there are now many pet travel products that make traveling with pets easier and much safer. Animals tend to get upset and disorientated when traveling by car. Knowing how to cope with this is vital to their wellbeing - as well as your own! We need to ask whether it is a good idea to take your companion animal on vacation with us – is it best for the animal as well or only best for us? Early acclimation to car travel is the key. If your pet dislikes traveling by car, it might be worth taking it out for a few trips in the car before you set off to try to prepare it for the journey ahead. If you will be going over international borders, make sure you have your pet's proof of rabies vaccination and their current health certificate to hand. Some companion animals shouldn't travel at all. If your companion animal is very young or very old, sick, recovering from surgery, or pregnant, then leave her at home. On the day you leave, maintain your pet's usual feeding routine. Anything out of the ordinary will probably make them feel more uneasy. Keep favourite toys and food handy as animals tend to respond better when they are surrounded by familiar things. As soon as you know your companion animal is vacationing with you, see your veterinarian. Have your vet check your companion animal's general fitness and ability to travel. Check with your vet that your pet has had fully up-to-date vaccinations. Take along a jug of cold water in case other water sources are not available. Stop every couple of hours to allow your pet to get some exercise. Remember to pack the lead! Don't let your pet put its head out of the car window in case grit and dust get in its eyes. This can cause a nasty injury or infection. Be sure to keep the windows closed, or open them slightly on a warm day. Don't leave your pet alone in the car if you can help it. The temperature can soar very quickly inside a locked car. If you must leave your pet in a parked car, make sure you lock the doors and park in some shade. Keep a first-aid kit containing bandages, gauze squares and antiseptic cream in the car. Anti-diarrhoea tablets are also useful. Ask your vet to recommend the best ones for your pet. You should keep the phone numbers of your vet and a 24-hour emergency vet hospital near where you are staying with the kit. If you'll be at your vacation spot more than just a few days, if possible get a reference from your vet for another vet at your destination. When you get to your destination, find the veterinarian's office on a map or ask around for directions. Knowing where to go if problems arise will make it easier on everyone. It is important to consider the fate not only of human passengers in the unfortunate event of an accident, but also our animal passengers! No matter what transportation you choose, your companion animal should wear a collar, license, and proper identification at all times. The identification tags should have your companion animal's name, your name, address and telephone number on it. If there is room also add the name and telephone number of a person who could serve as an emergency contact in case your companion animal is lost. A nylon collar or harness is best for either a cat or a dog. Never allow your companion animal to travel wearing a choke-chain. The collar-pull could become snagged on the carrier or other object and he/she may choke to death. A cat must wear a safety stretch collar to prevent getting hung up on hooks, branches, or other protruding objects. Keep handy your companion animal's shot records, a written description and several photos of your companion animal in case he/she becomes lost. You will need these to claim your companion animal from the local animal center when they find him/her. The written description should include your companion animal's name, height, weight, color, and any distinguishing marks. (5) No person shall drive, pull or push a vehicle upon a sidewalk: Provided that the provisions of this subregulation shall not apply to a perambulator, invalid chair, baby cart or child’s play vehicle.